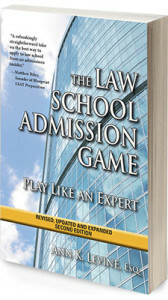 1) Hi Ann, I know you’ve expanded your bestselling work, The Law School Admission Game, with a recent new edition. I found the book invaluable in my own application cycle. Can you tell our readers a bit about what they’ll find in there and what’s updated from the previous edition? I’m so glad you found the book helpful – let me tell you, this updated version is so much better! It’s written for the savvy applicants of today, the ones who are concerned about jobs and student debt, who know they will face waiting lists and are sophisticated enough to ask about negotiating scholarships. It’s updated for current trends on letters of recommendation versus evaluations, applying online, getting fee waivers, and definitely talks more about optional essays which have become increasingly popular. The book includes a lot more case studies and examples, including explanations for why things were included in some candidate’s resumes and not others. 2) Now I think what people are most afraid of when they submit a law school application is that they’ve made some big mistake that they overlooked. Are there any common, easy-to-avoid pitfalls that you see students walk into on their applications? YES! Forgetting to send required transcripts and then later having acceptances revoked (someone actually shared this on my blog recently); uploading the wrong attachments (Posting “Why Duke” instead of your “Why Penn” essay); Typos are common, of course, and forgetting to check boxes, leaving applications incomplete. Those are some popular mistakes. 3) Most of the students you help are likely seeking advice on their personal statements. I know we get a lot of questions about that. How important is it to the overall decision? If a school absolutely always takes people with your numbers, and there are no red flags like character and fitness items in your application, then you can afford to be lazy with your personal statement. For everyone else, it’s the aspect of your application most likely to give you an edge. It’s the human interest piece, the piece that allows you to become a real, likable, interesting person. If a school doesn’t take everyone with your numbers, and especially if they don’t take many people with your numbers, the personal statement is key. I spend a lot of time talking about the personal statement in the new book, even giving examples of introductions and why individual people I’ve worked with decided to write about certain aspects of their lives and experiences in the personal statement and what they were trying to demonstrate. 4) I think many applicants are inclined to write about why they want to go to law school on a personal statement. Should this be avoided or is there a way to handle it well? I think it can be important to show that this isn’t a default decision for you, especially if nothing else in your background is a traditional pre-law school path. 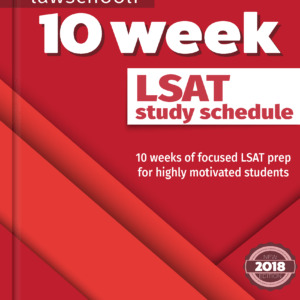 Be wary of getting too specific about the exact type of law you want to practice unless you can really back it up with facts from your experiences, and you can really demonstrate a commitment to it. For example, if you’ve worked in a family law firm, and had personal experiences with family law, and a social work degree, then saying you want to practice family law makes sense and you’ve made a credible argument. If you did one summer study abroad, don’t say you want to practice international law. There is a difference. 5) Recently we’ve seen that law school admissions offices are responding to a huge drop in the number of applicants to law school. The Times says we are headed for a thirty year low this year. How should this change the behavior of people currently applying to law schools? Should they target more schools for example? Should they be more aggressive in pursuing scholarships? I always believe in the value of a good scholarship to law school, one that is easily renewed for the second and third years, that relieves student loan debt. I’ve been writing about this topic since 2006 – even back when the economy was going strong! I think it’s a good time to get into a reach school. I’ve seen people get into T-14 schools in the last two years that I think would’ve only been in Top-25 a few years ago. 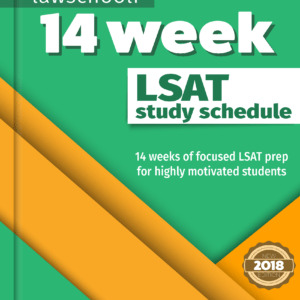 I still think that people with lower numbers (LSAT under 150, generally, for example) need to be very realistic about their employment opportunities depending on where they end up being admitted. While I had one client in that range get into a Top 20 school this year, she also had a nearly perfect GPA from a good school and a lot of other things going for her. 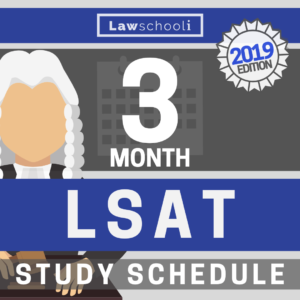 For most people in that LSAT range, you’re limited in school choices and should really think about what you can accomplish in your career and whether you can afford law school. Once you’ve done your research and know what challenges you will face in the future, you’re much less likely to have regrets later.